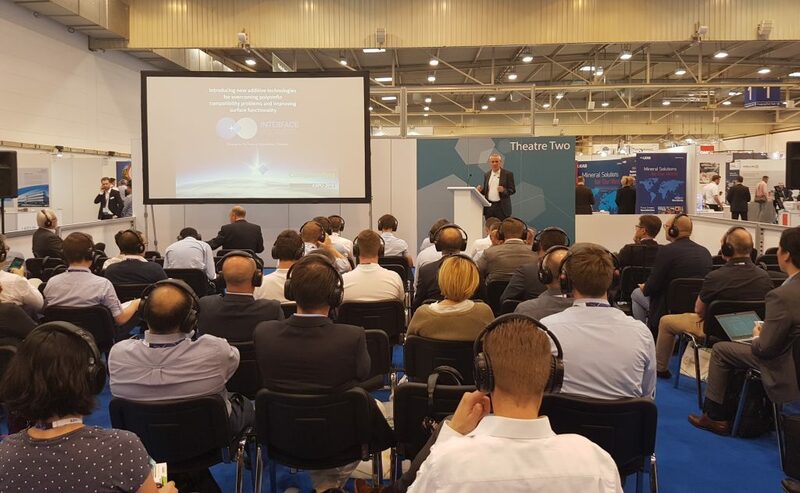 Interface Polymers Ltd. exhibited for the first time and gave an open forum presentation at Compounding Word Expo 2018, which ran from 27 – 28 June in Essen, Germany. Being an international exhibition for plastics additives and compounding, co-located with the Plastics Recycling World Exhibition, the show was the ideal event for Interface Polymers to showcase its patented, new ‘game-changing’ block copolymer POLARFIN®additive technology, which modifies the surface chemistry of polyolefin-based materialsto overcome polyolefin compatibility problems and improve surface functionality. 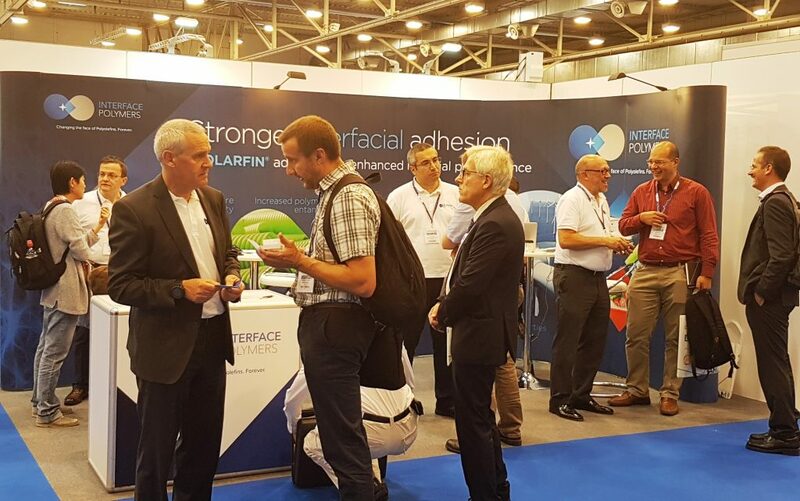 The show was a great success for the Interface Polymers team of commercial and technical people. Both days were very busy, with more than 200 visitors to the stand. There was interest from people working in a broad range of industries with compatibility problems, from packaging films and moulded parts to long fibre thermoplastics (LFT). POLARFIN can be used for a variety of applications depending on the product type, formulation and matrix to enable permanent interlayer surface adhesion, increase polymer chain entanglement, improve polar particle and fibre matrix adhesion, or provide a tailored dispersion in a polyolefin or polar polymer matrix. There were also visitors from the Plastics Recycling World Exhibition, as POLARFIN can be used as a surface functionality improving additive, not only for virgin materials, but also to help the global environment by enabling the recycling of incompatible plastics, such as PE with PS/ PA/ PET. The stand was particularly busy on day 1 after the presentation given by Simon Waddington, Business Development Director for Interface Polymers, which attracted an audience of over 140 people, with standing room only for some. The presentation titled: ‘Introducing new additive technologies for overcoming polyolefin compatibility problems and improving surface functionality’, included a ‘live’ demonstration using Super Glue to successfully bond two polypropylene (PP) discs containing POLARFIN additive together that could not be pulled apart. This innovative additive technology is offering companies new opportunities to significantly improve the performance and cost competitiveness of polyolefin-based materials. POLARFIN additives can be used across a diverse range of market applications and material types, including: masterbatchesand compounds; thermoplastic composites; filled polymers; sheet and film products. According to Interface Polymers’ processing guidelines, its additives can easily be incorporated into a formulation and used with existing polymer conversion processes, such as extrusion, injection or compression moulding, with little or no need to modify existing production equipment. Specific grades of POLARFIN additive can also reduce processing costs, as well as providing enhanced surface properties and beneficial attributes that add value to end use applications. The company is on a steep growth curve, having expanded its in-house R & D team at the start of the year, in response to growing customer-led market demands for polyolefin surface functionality and polymer matrix compatibility solutions which can offer enhanced material performance across a wide range of applications in the packaging, construction, agriculture, automotive and recycling sectors.